100° Wide angle lens can increase the phone camera's range about 49%. All images will reduce glare, blurring, distortion, reflection and ghosting. Suitable for taking pictures with your iPhone 7 / 7 plus / iPhone 6 / iphone 6s / iPhone 6 plus /iPhone 5s/iPhone 5 /iPhone SE and most Android smartphones. 1. Wide Angle Lens and Macro Lens are connected together, you can unscrew them into separated part. 2. If the phones flash is very close to the phones camera, it may be blocked by the clip. 3. The macro lens will focus on the point you need to show. It makes foreground elements outstanding with blurring out background. Therefore, the whole image will not as clear as wide angle lens'. Please get very close to object and what you want. Thanks a lot for your deeply understanding! 2 In 1 CAMERA LENS - The perfect combination to meet your need. 100° Wide Angle Lens & 15X Macro Lens help to capture valuable moments while on the move. Wide angle lens enables you to capture a wider range of view without distortion. Macro lens will get you 15X closer to object at a distance between 0.39-1 inches in HD resolution, making sure you don't lose out on any of those finer details. HIGH PRECISION QUALITY - Each lens is made of high-class glass with 28 layers of film coating, reducing glare, blurring, distortion, reflection and ghosting. The lenses will bring out your artistic side and record all your magical life moments. Enjoy and live your photography! PORTABLE & EASY TO USE - The combination kit weighs only 1.11oz - much lighter than similar products and easy to carry. Fully detachable clip with soft rubber is easy to adjust which securely fastens your lenses to your phone. Does not scratch, mark or fall off your phone. IMPACT & SLIP RESISTANT WITH DUST PROTECTION - Lenses are carefully crafted with high quality aluminum alloy that helps reduce damage from accidental drops. Coated with frosted paint that is non-slip and feels great! Fashion design like flower shows unique experience of shooting. 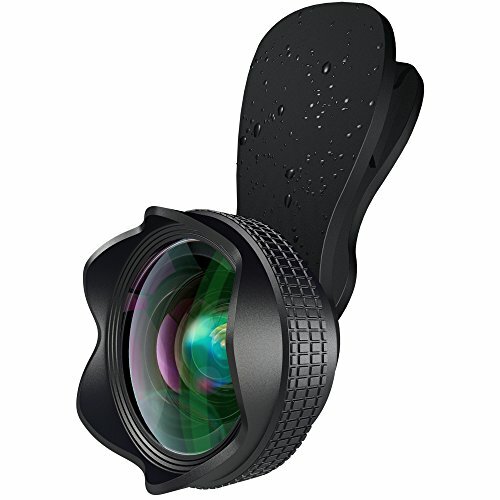 Dust cap protects lenses from dust. Cleaning cloth included in the package will help remove any dust. WIDE COMPATIABILITY - Suitable for most smartphones: iPhone7/7 plus/6 /6 Plus /5 /5S /SE /Android phone / Samsung, etc. PACKAGE INCLUDES 2-in-1 HD lens kit: 100° Wide Angle + 15x Macro Lens, Lens Clip, Cleaning Cloth, Soft Bag & Manual & Box. 24-Month Warranty and lifetime customer service.